Great Z's: Great British Contributions To The World: The Industrial Revolution, The Beatles, and...Socialized Medicine? Great British Contributions To The World: The Industrial Revolution, The Beatles, and...Socialized Medicine? 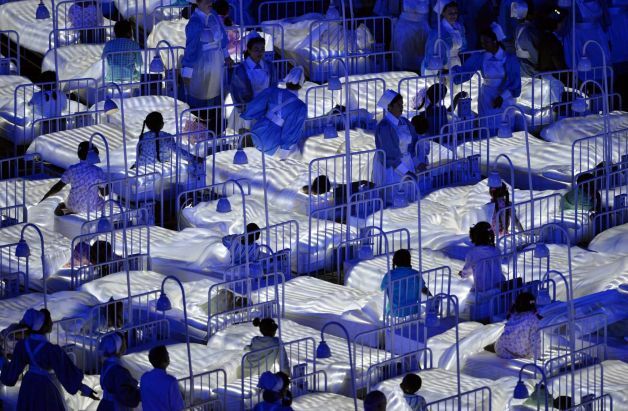 If you were part of the estimated one billion people who watched the opening ceremony of the 2012 Olympics in London you were treated to a spectacle of great British contributions to society. Multiple Beatles tunes were played. J.K Rowling of Harry Potter fame was there reading "Peter Pan." Her Royal Highness, The Queen was accompanied to Olympic Stadium by Bond, James Bond. Yes the Brits are rightfully proud of their achievements. 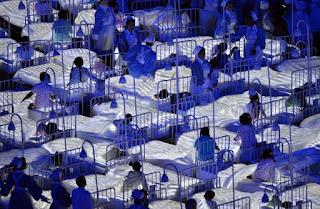 In the midst of this pageantry, they also rolled out, literally, another one of their grandest accomplishments: hundreds of hospital beds representing their National Health Service (NHS). Many of the dancers on the stadium floor were actual NHS employees. With taxation covering the cost of "free" health care, over two thirds of the British are happy with their socialized medicine. This is an astonishing high satisfaction rate despite the well publicized list of shortfalls in the program. There are the denials of care (death panels) for the extremely old and extremely young patients. State of the art drugs are slow to be approved by NHS committees. A waiting time of 18 weeks until treatment is considered acceptable by this authority. But the Brits, or at least their aristocratic elites, seem to be able to see past all that and grandly flaunt this bureaucratic nightmare to the world. If so many British citizens love their "free" universal health care, might it not work here in America? We American doctors frequently criticize socialized medicine for their limits on health care choices and long wait times. However, one perk of being a physician in the NHS is that you can't be sued for medical malpractice. The NHS indemnifies all its employees, including doctors and nurses. If a patient wants redress for malpractice, they have to sue the NHS itself, a giant government program with millions of pounds to defend itself. As a matter of fact, in response to rising legal costs, the government wants to make it even more difficult for its citizens to sue the NHS. It is cutting funding of monetary aid that help the poor find legal representation. So would American doctors be willing to work under socialized medicine if they cannot be sued? If the responsibility of defending frivolous medical malpractice cases was pushed to the government, will that be enough to get the support of the AMA and other physician groups? I have a hunch that there would be a large number of physicians who would support socialized medicine if they were immune from medical malpractice. However with the strong lobbying of trial lawyers here, we would probably get the worst of both worlds: socialized medicine and unlimited uncapped medical litigation. So I'm not holding my breath on us imitating the NHS in the near future. It's not shown in the picture above, but some of the beds in the show last night had two patients in them, making me wonder if THAT'S how the NHS cuts costs.